GPS tracking devices are a more recent application of global positioning technology. The military has long used GPS to monitor troops and military activities but civilian applications have recently become mainstream as economies of scale have grown and pricing has dropped. A classic use of GPS systems, for example, is in smart phones technology for apps that use navigation and other location services. Other uses of the GPS system are for tracking devices that can locate vehicles and other assets like machinery, boats, jet skis and so on. But how does GPS actually determine location? GPS is the acronym for Global Positioning System. This system includes over 24 satellites that are orbiting the Earth that send signals to receivers on the ground that is then analysed to establish the location of the receiver. The signal sent includes an exact position of the satellite, its trajectory and the exact atomic clock time. The receiver then takes this information and using a process called trilateration calculates the exact location of the receiver. Trilateration is a more complex version of triangulation. To get the most accurate location the GPS tracking device receiver must have at least three signals. We’ve all seen examples of GPS tracking devices in movies where a hero is tracked via a small capsule but unfortunately, the technology is not yet available to have tracking devices injected under our skin. But the technology does work well with vehicles or larger objects with adequate power supplies available. 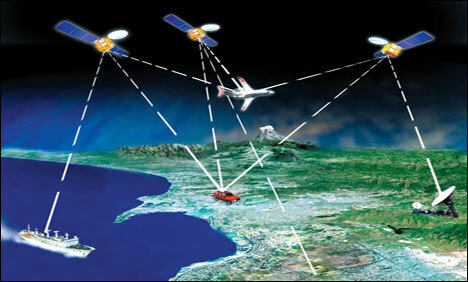 The basic principle of GPS tracking devices is that the receiver calculates the location and then transmits it over an internet connected network – e.g. the mobile phone network or another satellite system like Iridium or GlobalStar. A fleetminder tracking device, for example, can send data either to a mobile phone or to the fleetminder server where the user can log in 24/7 and view live web location of their vehicle or asset and review previous location and journey report. GPS technology has come a long way since the early development and use by the military. Who knows what’s around the corner?